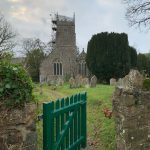 The Norman Church of St Andrew: A Well Kept Secret nr. Salisbury, Wilts. 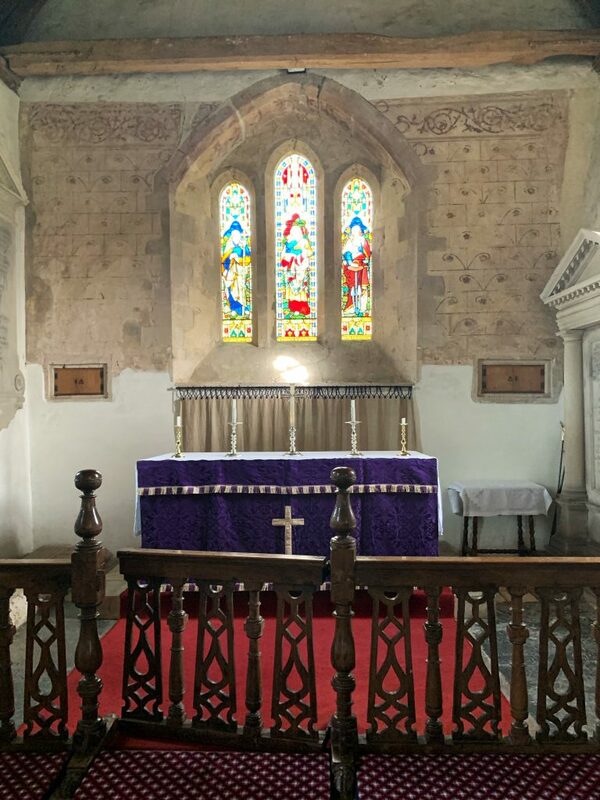 It’s very rare to find an English parish church that hasn’t been heavily restored. 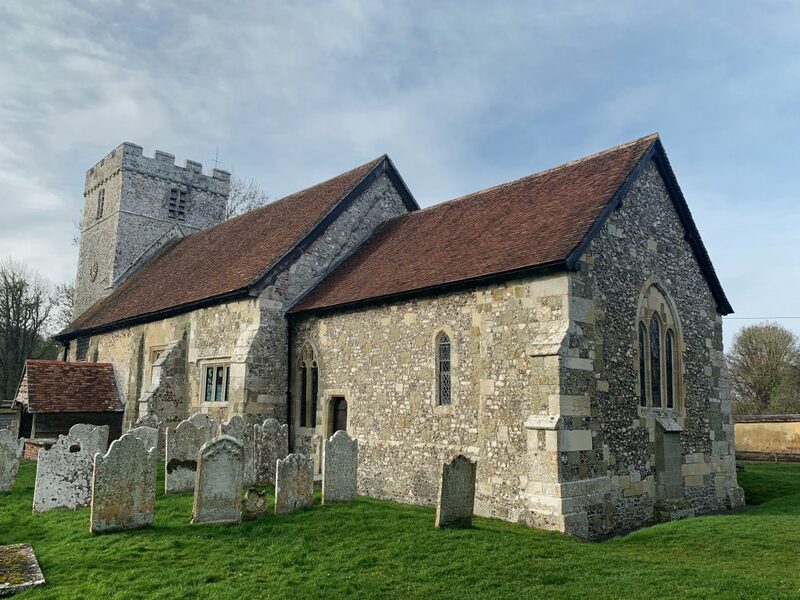 The 12th-century church at Great Durnford has additions from between the 13th – 16th centuries but escaped the heavy-handed restoration of later centuries. 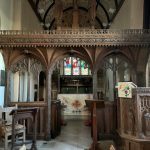 There was a great revival of interest in Church buildings during the Victorian Era which went hand in hand with the population increase that came about with the industrial revolution. At the turn of the 19th century there were roughly 10,000 parish churches in England. 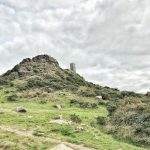 A survey revealed that over 3000 new churches had been built by 1872, and 925 existing buildings had been completely rebuilt including St Catherine’s at Temple on Bodmin Moor; absolutely charming but a complete Victorian fabrication. 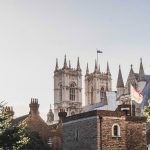 Many of the remaining ancient churches were heavily restored to the Victorian ideal of what the building should have looked like with an eye to Romanticism and Gothic Revival – both popular movements of the era. 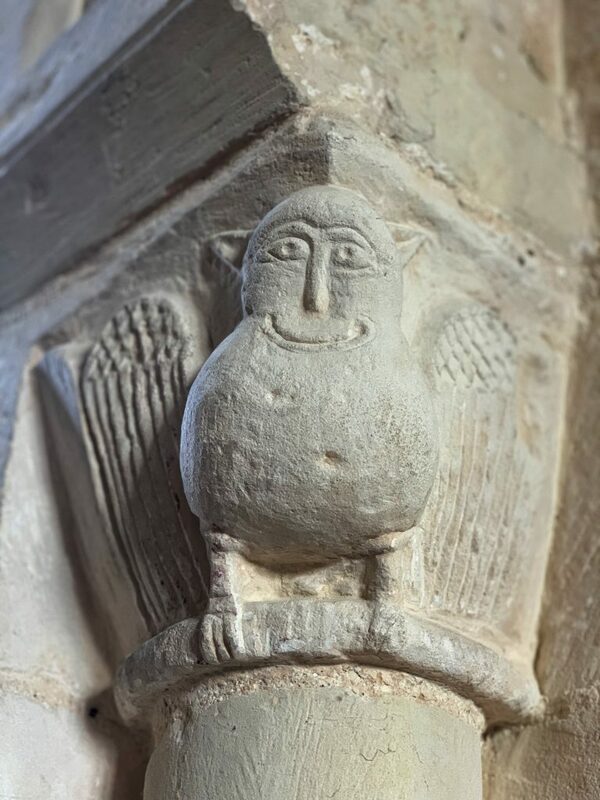 Fortunately, the Church of St Andrew is one of a very small number that escaped such a fate and was sympathetically restored remaining true to its early Norman origins. 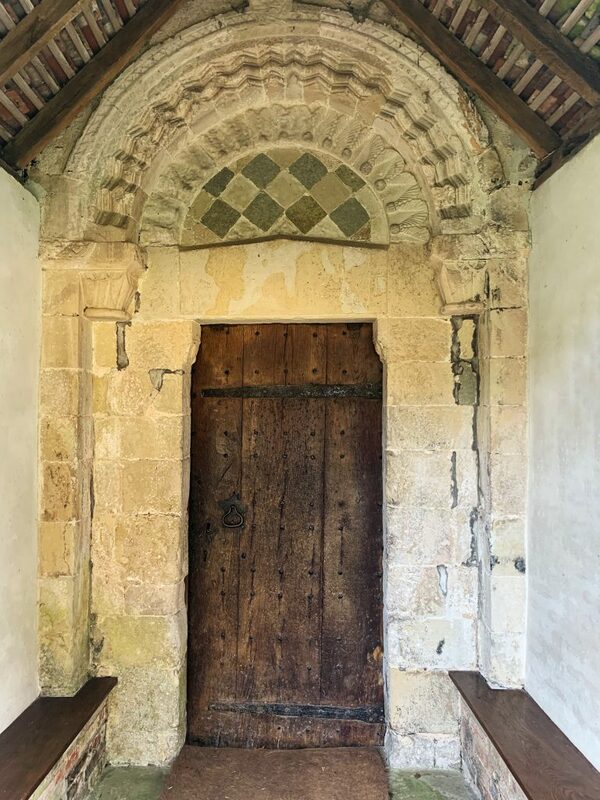 Both the north and south doorways are Norman indicating that the nave has remained the same width since the 12th century. Both doorways have the stone zig-zag archways that are typical of the period. The north door (above) has an unusual ‘shuttlecock’ design surrounding the diamond shaped green and white stone which make up the tympanum. Tympanum is just the posh architectural word for a decorative wall surface over a door or window which can be found above the lintel and below the arch. 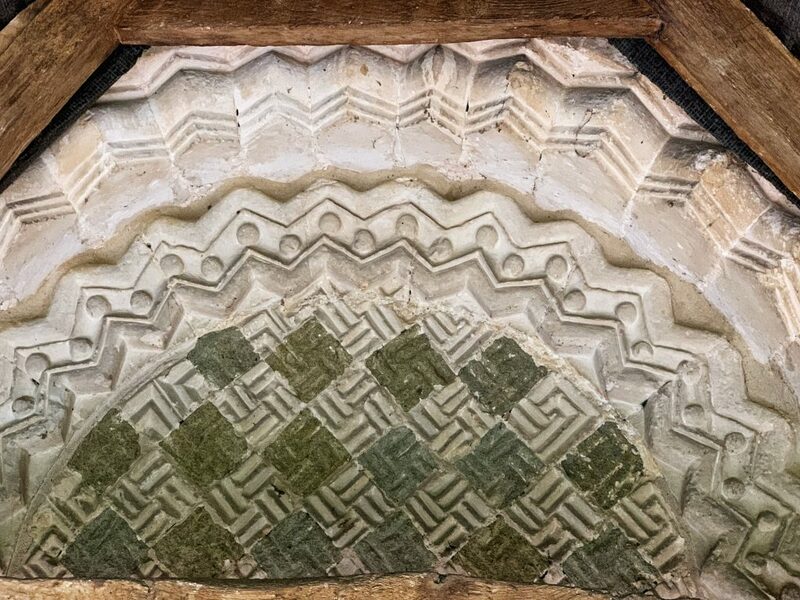 The Chancel at St Andrew’s is accessed by a Norman archway which once again is patterned with the distinctive zig-zag design and flanked by simple columns with charming grotesque designs each side. Above the arch is a large mural that is, sadly, in a very poor state of repair and is most probably a Doom Painting (ie. wall painting of the Last Judgement). There are very few Doom Paintings remaining in England, maybe only about forty in total, as most were destroyed during the Reformation. 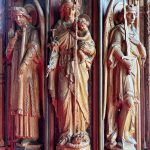 The oak lectern has resided in the church since the early 17th century when it was created during the reign of James I, maybe at the same time as the pulpit that is dated 1619. 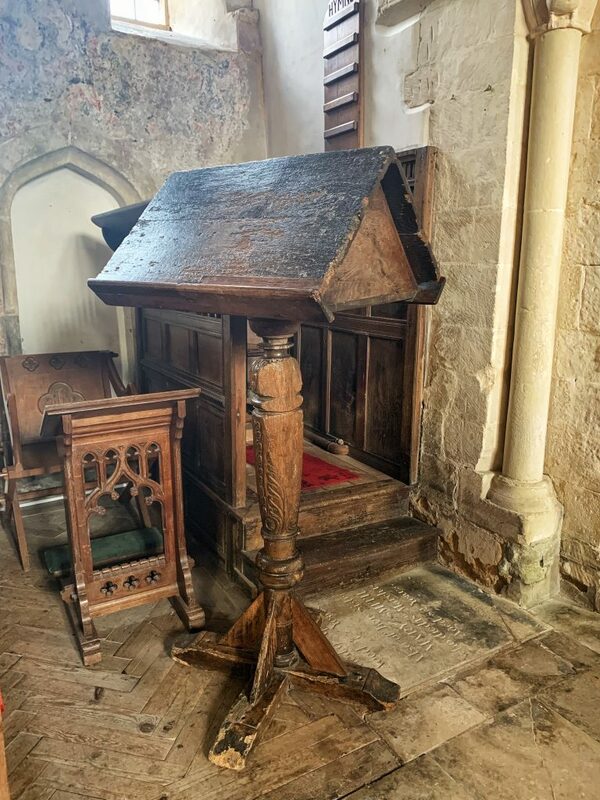 The Jacobean lectern still has its original revolving desktop and had a 1571 edition of Bishop Jewell’s (1522-1571) Apologia ecclesiae Anglicanae including the Replie to Harding’s Answere (1565) and The Defense of the Apology (enlarged edition 1571) chained to the desk. The book was placed in every parish church in England by order of Elizabeth I. 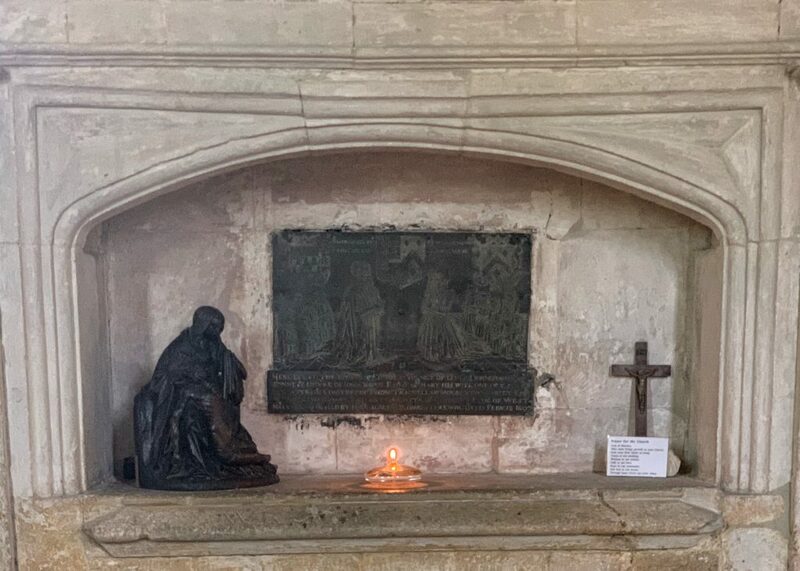 In 1970 thieves stole the book which had been kept at the church since it was published in 1571 and had been chained to the lectern for over 350 years. 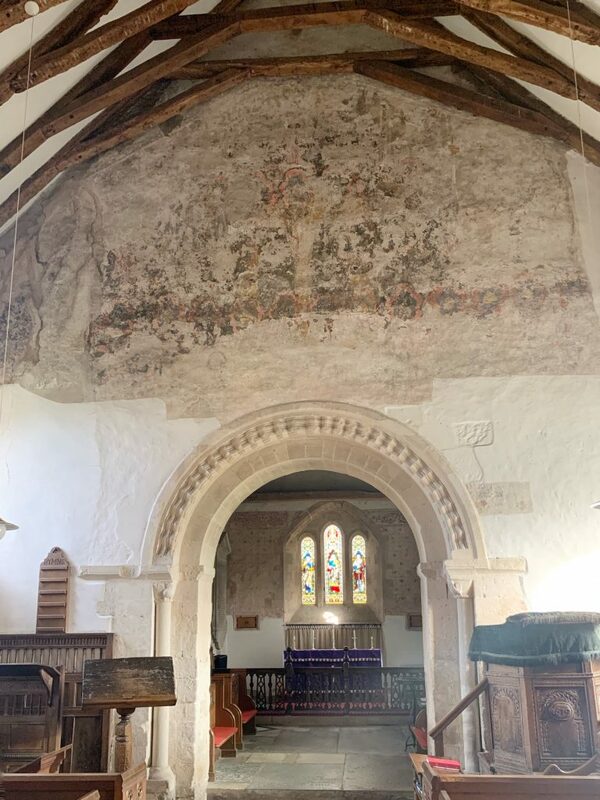 The chancel is full of interesting details including the 17th-century communion rail below the medieval wall paintings on the east chancel wall. On the south wall is a recessed tomb with a brass plaque in memorial to Edward Younge dated 1607 who had six sons and eight daughters. 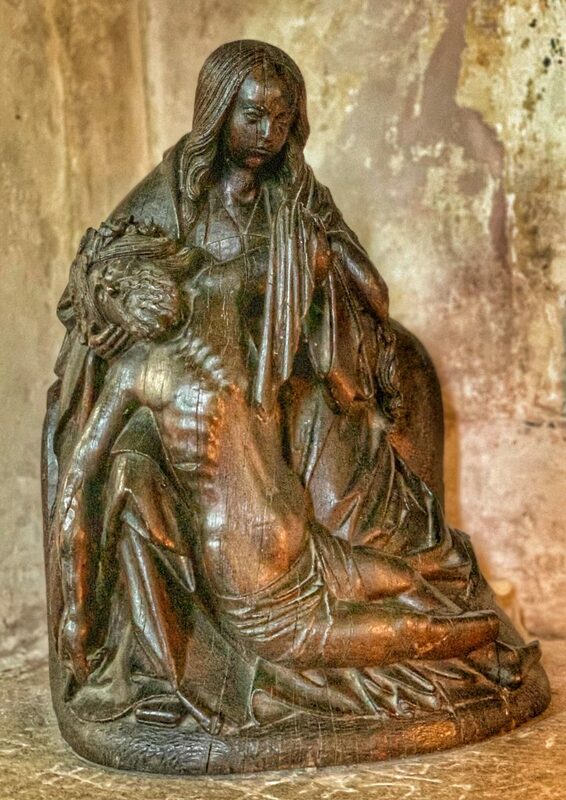 The piece resistance must surely be The Pieta, a small but beautifully carved Flemish wooden sculpture c1500-1510, that at one time in its history was housed at Warwick Castle. 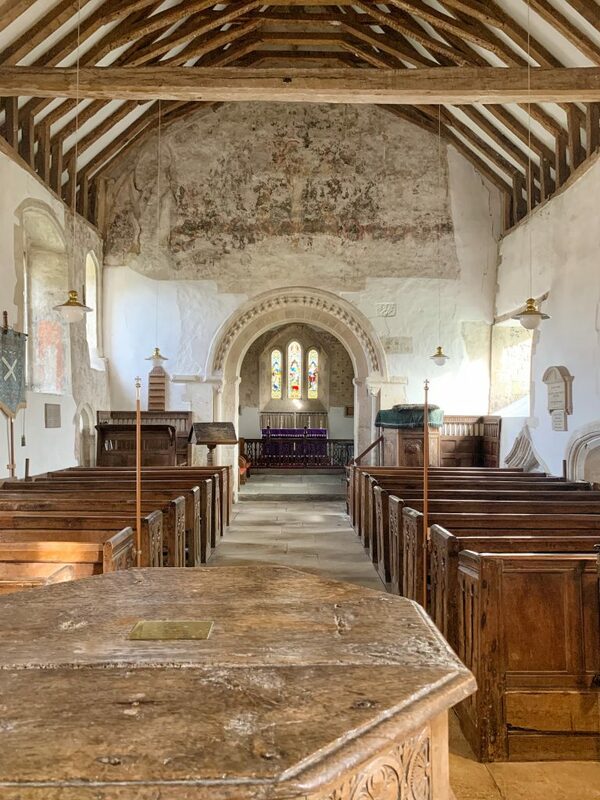 …And finally, are these the oldest pews in England? 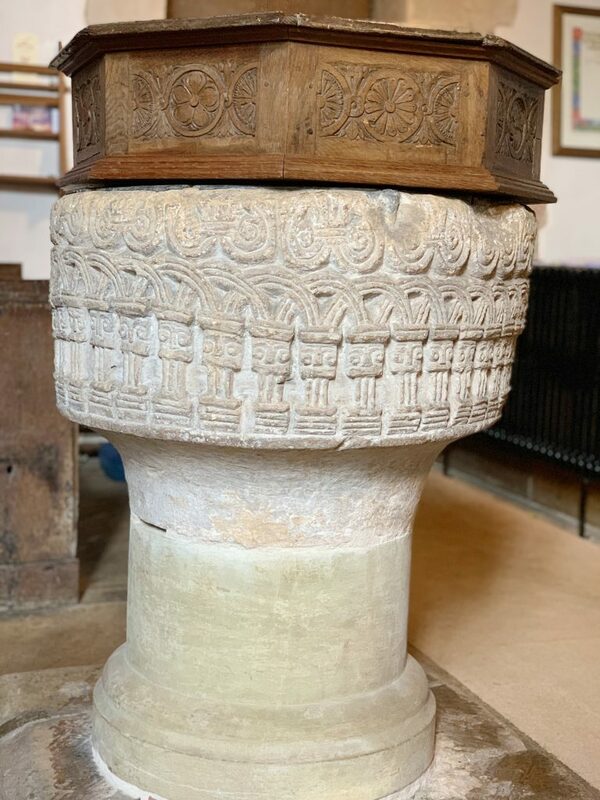 Before leaving St Andrew’s Church make sure you have a good look at the Norman Font with its primitive interlaced arches. And behind the font, towards the rear of the church are a number of small simple seats. 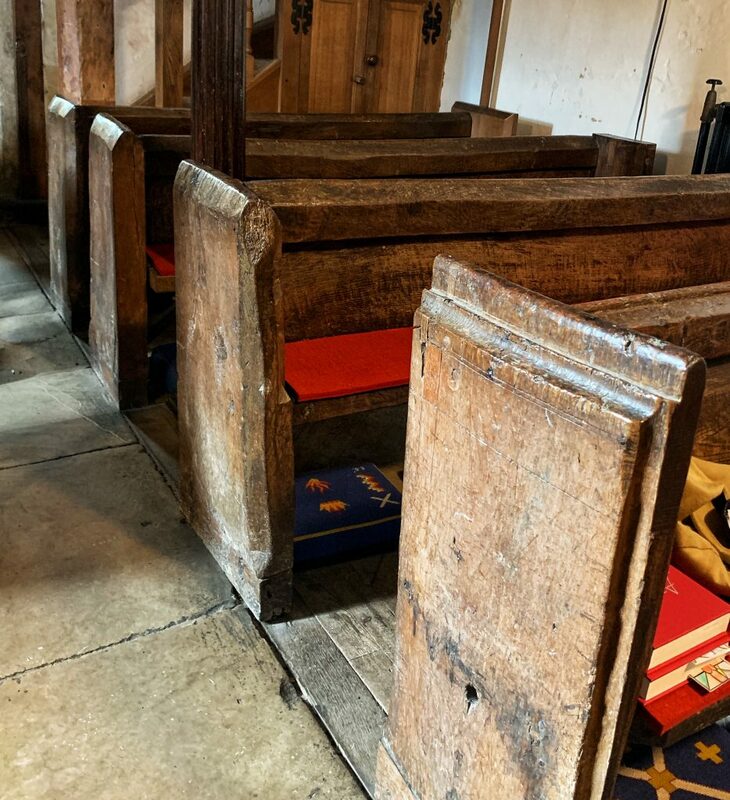 These rough hewn pews date all the way back to the 14th century and are among the oldest existing pews in the country. 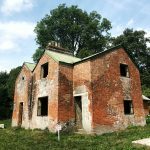 There’s a plethora of historical sites in this area of Wiltshire – far too many to list and so below are just a few in the nearby vicinity. 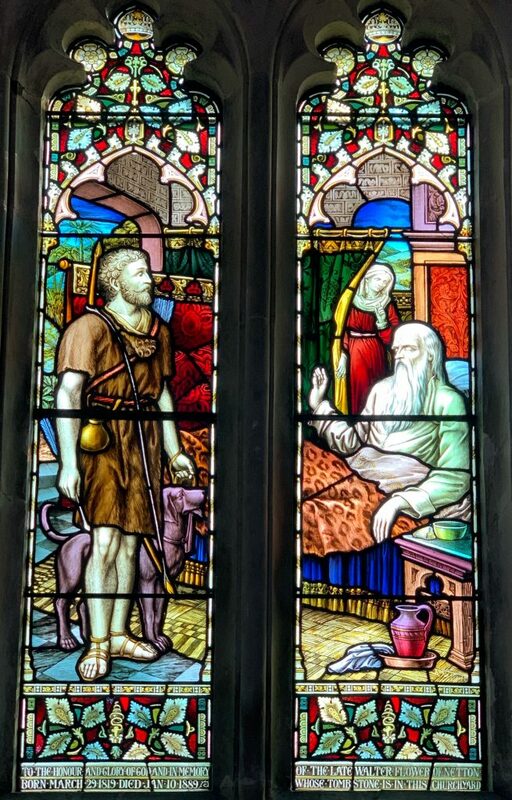 Salisbury (New Sarum) – A medieval cathedral city with a magnificent 13th-century cathedral that has the tallest spire, largest cloister and biggest cathedral close in Britain and is also home to one of the four surviving copies of the Magna Carta. Old Sarum – is the original site of Salisbury and was home to its first Cathedral. Located just two miles north of the present city, and just four miles south of Great Durnford, Old Sarum sits atop a huge Iron Age Hill Fort. It’s here that a Norman castle was constructed c.1070 for William the Conqueror and where, in 1086, he made all landowners swear an oath of fealty to him known as the Oath of Salisbury. Stonehenge – The iconic Neolithic site is one of the best known ancient wonders of the world, never mind just Britain! The stone circle is the centrepiece for every visitor, but, is just a small part of a much larger complex that has over 700 smaller archaeological features and is a UNESCO World Heritage Site.